More than almost any other outdoor sport, ski jumping and ski flying are determined by the weather. It is not just that the wind conditions have a decisive influence on the results of jumping competitions. It already starts weeks before the event as the hills are being prepared. Nowadays, snow cannons can make up for lacking snowfall, but these too require certain weather conditions for optimal operation—mostly at night and outside of business hours. Skisport- und Veranstaltungs GmbH and the Ski Club of Oberstdorf (SCO) are responsible for organizing top-class international competitions for the FIS (Federation International de Ski – International Ski Federation). Oberstdorf has hosted the Nordic Ski World Championships twice before in 1987 and 2005 and each year the first jumping competition of the season takes place at the International Four Hills Tournament. This winter, Oberstsorf also hosted the 2012 FIS Nordic Combined World Cup and the 2012 FIS Team Tour. Before and during these type of events, there are often situations requiring decisions extremely dependent on weather conditions. “Often, the race organizers are still groping around in the dark as they always have…,” according to Dr. Peter Krujier, Vice President of the SCO and Board Member of the organizing committee. The forecasts available online or the radio are just too imprecise for the event location. And the weather data demonstrate this well: temperatures, humidity, precipitation and, of course, the wind can sometimes be significantly different from the German Weather Service’s weather station just 2 km away. And the differences can be even greater depending on atmospheric conditions. To help overcome this problem, zu bekommen, micKS MSR GmbH and G. Lufft Mess- und Regeltechnik GmbH spontaneously agreed to start a pilot project for mobile weather stations and forecasting services for Winter 2011/2012. Two weather stations equipped with the compact WS600 weather sensor and a Metrilog recording system were put into service on short notice. 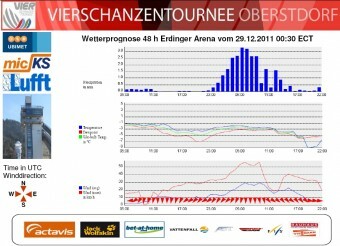 Subclimate, small-scale weather forecasts are provided by UBIMET, a private weather service from Vienna. The weather stations were designed so that all instruments would be attached to a 2 m high mast which can be easily and quickly taken to any location and clamped onto an available railing or something similar. The only other requirement is an extension cord to connect to electrical service. Once the electric is connected, the device activates on its own and sends its data to a cloud server via cellular service. The weather service and the event organizers can then access the data from the cloud. A portal was created on the web server to allow the organizers and the teams 24/7 access to current data and very precise 6 and 48 hour forecasts. The forecasts are even given in 15 minute intervals to allow for truly snap decisions. A weather station was also temporarily set up to measure snowfall in the distant cross-country skiing stadium. In addition, a team was placed on call to start making snow once the dew point reached ca. -4°C. Automatically-controlled snowmaking is also conceivable. 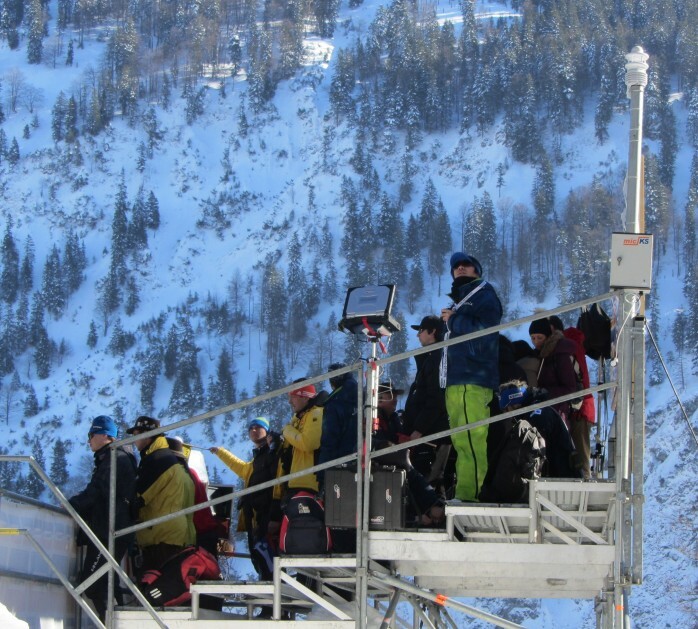 During the Four Hills Tournament, two weather stations were placed at jump height and one on the landing slope on the K125 hill in the “Erdinger Arena.” Afterwards, the compact units were easily moved to similar positions on the big Heini Klopfer Ski Flying Hill to be used for the FIS Team Tour in February 2012. Image 3: All teams from participating nations receive a daily forecast printout with 6 and 48 hour forecasts. A thorough introduction to the service was given to team leaders before every event. Hans Schmid, operations manager of the event organizer says, “We’ve never had such detailed weather data…” A precise evaluation of the units’ forecasts will be made and then a decision taken whether the pilot should become a permanent service. The event organizers in Oberstdorf have decades of experience in this “business” and, from their regular international contacts, know that other organizers and the FIS have similar problems at more than 200 FIS hills around the world.